We take a refundable commitment fee of Rs.1000 from you. We Provide you a personal manager who helps in getting you a job. 6% of deposit amount is deducted at the time of refund. The fee is not refundable until the manager of outlet approves. Thanks for doing business with forehotels.com. Forethotels.com deserves the right to refuse or cancel a membership in forehotels.com at any time and for any reason. If forehotels.com refuses a new or renewing membership, organizations will be offered a refund for the remaining portion of their membership at the time of termination. Forehotels.com will not be obliged to make any refunds to the members in event of cancellation by members. If however, still the membership is cancelled by the members, all benefits of physical or digital format received by member organization must be cancelled/returned to the forehotels.com. If in event management cancels the policy at its discretion, it is upto the management to solely decide about the refund of membership fees. All refund requests must be made by the organization’s primary contact or credit card holder. Refund requests must include the name of the organization, card holder, and/or transaction number. If Company becomes aware of an alleged violation of any of the terms contained in this Agreement or any other policy that has been posted on its web site made available to Customer via email or posted in any other form Company shall initiate an investigation. During the investigation Company may restrict Customers or Customers Users access to Company products and services in order to prevent further possible unauthorized activity. Company may at its sole discretion restrict suspend or terminate Customers account without notice or refund or pursue civil remedies as it deems necessary. Company shall be able to access any restricted areas or disable any security preventing the Companys investigation s. Company shall notify the appropriate law enforcement department of any such violations. Company shall not be responsible for any payment refunds or compensation in any way for service disruptions or termination resulting from violations of this Agreement. Company reserves the right to provide any and all available information in order to comply with legal court order subpoena discovery request or any other authoritative request by governing body or agency. Forehotels.com is for those who serve the world. 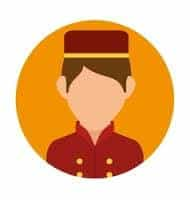 In this day and age of connectivity forehotels.com serves a purpose of being a seamless medium between suppliers, hoteliers and job seekers all under one roof. With an extensive pool of qualified talent to choose from, you will be spoilt for choice.